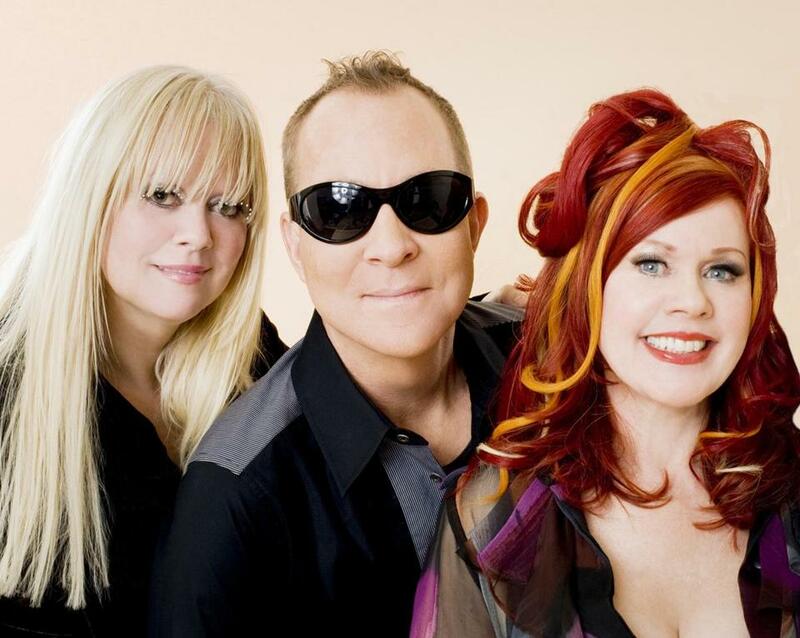 Cindy Wilson (left), Fred Schneider, and Kate Pierson of the B-52s. For years, the B-52s have kept playing minus various members: Guitarist Ricky Wilson died, then his singer sister Cindy took a couple of breaks, and now guitarist-drummer Keith Strickland no longer tours. The group — which brought a riotous, retro-kitsch sensibility to the punk and New Wave eras and spearheaded what would become the vibrant Athens, Ga., scene — plays the Boch Center Wang Theatre on Friday, with Cindy back in the fold. So what would it take for the group to stop feeling like the B-52s? Pierson credits 1989’s mega-successful “Cosmic Thing” album (especially songs like “Deadbeat Club” that looked back at their early Athens days) with helping to heal the band, though Cindy took time off not long after. Q. I’ve always described the B-52s as a combination of Ethel Merman, Yoko Ono, surf rock, and Z-grade sci-fi. A. Z-grade sci-fi! (laughs). That’s a pretty good assessment. I mean, I don’t get the Ethel Merman part, except that we do a lot of really ballsy kind of singing. Q. That’s the only comparison that I’ve ever been able to make for Fred’s voice. It’s that same full-chested, commanding sound. A. (hearty laughter) Yes, that’s what he has. Q. And that sounds insane on paper, but it works so well in practice. Do you ever stop and look at what you do for a living and think: I can’t believe this is my career, this is my legitimate job? A. All the time (laughs). Meanwhile, Fred is always like, “I don’t know what I would do. I couldn’t do anything else.” We landed luckily in this wonderful job. And when we moan and complain. . . . We’d have travel difficulties, and the air conditioning in the hotel went out the other night and it was suffocating, and we complain, uggghhh. But ultimately, we all have to say this is the best job in the world, and we’re so lucky to be doing this. And one other thing that amazes me is that people say over and over and over, “You changed my life. You got me through high school. You got me through hard times.” We didn’t really have to do anything but be ourselves and do our jobs to make so many people happy. I find that so gratifying. Q. It’s been 10 years since your last album, which was “Funplex” in 2008. What does it take to get the B-52s into the studio, as opposed to on the road? A. We recently recorded a couple of our hits with [producer] Mike Denneen, who lived in Boston. He just passed away, very sad. That was so sad to hear. He was great. So we got back into the studio for that, and I was kind of hoping we might do one [new] song. It takes a lot. I don’t know when we’ll ever do another album, I have to say that. Of course, never say never, but. . . . When we come together, we all live in different places and we have to find a mutual place — that’s Athens, probably — and record there and fly there and rent houses there and, well, it’s just hard. It’s so expensive. Then there’s the jamming process. We sometimes jam for a long time and then we collage the pieces together. That process is what makes us unique, but it’s also time-consuming. We can’t just pop out a song in a day. We can’t come together and each of us writes a song. It wouldn’t be the B-52s. Q. Is the band aware that there’s an improv game called “Hey, Fred Schneider”? A. Yes, yes (laughs). I do Fred Schneider all the time. When I tell friends something about Fred, I always do his voice. I can’t help it, you know? If we’re changing something in the dressing room, like: [Schneider voice] “It was not nailed down!” You can’t help it. It’s just so idiosyncratic. It’s distinctive. It’s just Fred. It’s just an instrument beyond belief. Q. How does it feel knowing that your group is iconic enough that one of you is a legitimate impression that people can do? Does that feel like a point of honor? A. That people do an impression of Fred? Oh, well, he loves it. He actually participated with Second City. He’s done improv stuff with them. Yes, so he’s in on the joke. My mother used to say, “Imitation is the most sincere form of flattery.” Fred sometimes says before “Love Shack,” “A lot of other people cover this song, but we do it better.” So Fred does his voice better. Interview was edited and condensed. Marc Hirsh can be reached at officialmarc@gmail.com.